In the wake of the Vybz Kartel murder trial other cases shed light on the quality of justice dispensed by Jamaican courts. Comparing and contrasting is always a useful exercise. This morning when I read the abbreviated article shown above i thought, really? 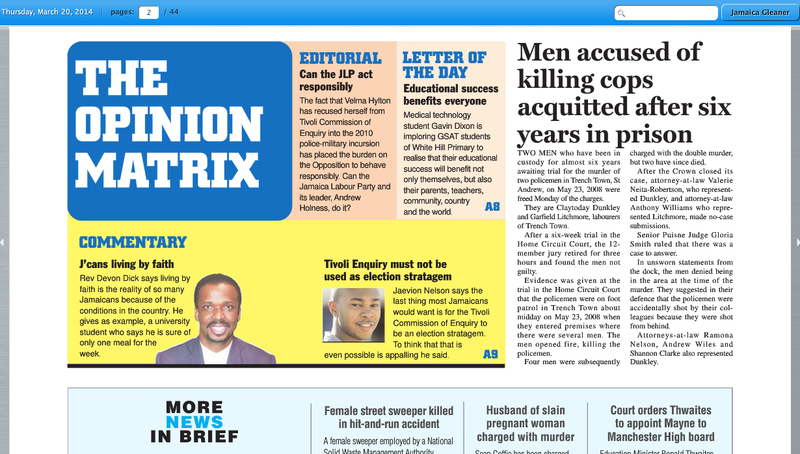 Two men, Claytoday Dunkley and Garfield Litchmore, falsely accused of killing lawmen, lose 6 years of their life due to police bungling or worse, and the most the Gleaner can do is run a brief two-column report on page 2 with skeletal details of a case that seems to be a flagrant violation of human rights. Not only that, you would only have read this article if you subscribed to the hard copy or the ePaper of the Gleaner, it wasn’t available on its website. Why not? Is it because the two concerned are labourers from Trench Town and not from Upper St. Andrew? What recourse if any do they have? Will any members of the Police be held accountable for this travesty of justice? Buju Banton might have smiled and called this low-budget justice for low-budget people…aside from this the admission that the police apparently falsely charged the two men raises doubts about the reliability of evidence they presented against Vybz Kartel and co which as we all know ended in the conviction of the superstar DJ and three of his co-accused last week. Juxtapose this for argument’s sake with the 2007 trial of former UWI student Rodney Beckles, accused of stabbing one Khalil Campbell to death over a chillum pipe. 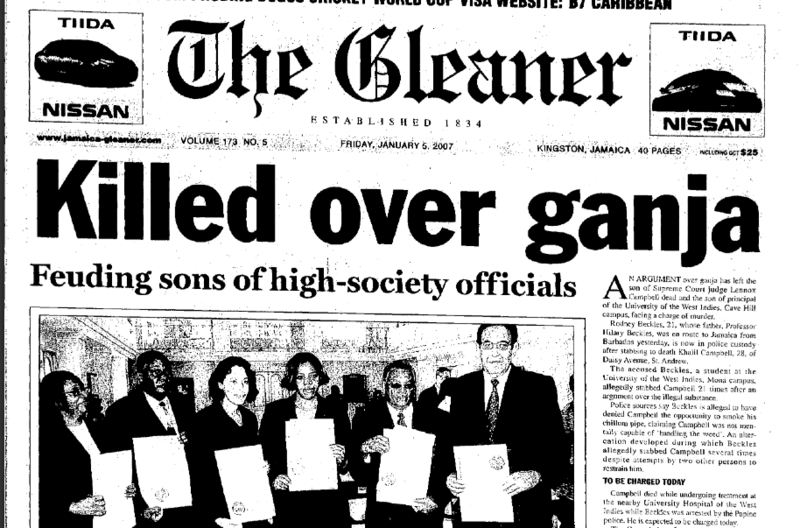 On that occasion the story occupied the Gleaner’s front page, seen below, no doubt because the protagonists were both sons of ‘high-society officials’ as the headline pointed out. Rodney is the son of Sir Hilary Beckles, Principal of the University of the West Indies, Cave Hill campus. The young man he killed was none other than the son of Justice Lennox Campbell, yes you read it right, the very Supreme Court Judge Lennox Campbell who presided over the Kartel trial. The murder took place in January 2007 and by the end of November the same year young Beckles had been acquitted, much to the relief of his parents. AN ARGUMENT over ganja has left the son of Supreme Court judge Lennox Campbell dead and the son of principal of the University of the West Indies, Cave Hill campus, facing a charge of murder. Rodney Beckles, 21, whose father, Professor Hilary Beckles, was en route to Jamaica from Barbados yesterday, is now in police custody after stabbing to death Khalil Campbell, 28, of Daisy Avenue, St. Andrew. The accused Beckles, a student at the University of the West Indies, Mona campus, allegedly stabbed Campbell 21 times after an argument over the illegal substance. Police sources say Beckles is alleged to have denied Campbell the opportunity to smoke his chillum pipe, claiming Campbell was not mentally capable of ‘handling the weed’. An altercation developed during which Beckles allegedly stabbed Campbell several times despite attempts by two other persons to restrain him. The jury found that Beckles was not guilty of murder or manslaughter. Beckles who was represented by defence lawyers Patrick Atkinson, Deborah Martin and Robert Fletcher gave sworn testimony in his defence and was thoroughly cross-examined by prosecutors Caroline Hay and Ann Marie Feurtado -Richards. Beckles said he acted in self defence after Campbell who was known to be mentally ill, rushed at him like a raging bull and held onto his foot. He said he began hitting him and when his foot was released, he saw blood on his clothes and blood on the deceased’s chest. He said he and a friend were smoking ganja from a chalice and it was after they denied Campbell’s request for a smoke from the chalice that the incident took place. The prosecution led evidence that there were 16 superficial injuries to the body and two stab wounds. The fatal injury was a stab wound to the chest which penetrated the heart. The pathologist said he saw defensive injuries to the body and it was his definition that the deceased was the victim and the attacker was the aggressor. The defence brought medical evidence to show that the deceased was diagnosed with paranoid schizophrenia and cannabis abuse and was aggressive when he did not get his medication. So what do you think? Is the second a case of high-budget justice for high-budget people in contrast to the case of the Trenchtown labourers, Claytoday Dunkley and Garfield Litchmore? Again what does this indicate about the quality of justice meted out by Jamaican courts? Finally was Kartel found to be guilty or was he to be found guilty by a police force and judiciary determined to make an example of him? Of course, you can’t really compare cases, as common elements may appear to be present, but the different details of each case are not trivial. Are police procedures shoddy? Probably? Are juries influenced by status? Maybe. Were juries then more influenced by such things than juries now? Were witnesses more or less convincing? What do we know about the composition of the juries? To me, these are variables that can sway your conclusion in many directions. Had the cases beed determined by a panel of judges we would probably be able to say more about what ‘systematic’ or ‘systemic’ things could be going on. Annie, I like comparisons, too, but not all are as valid as they may seem from some perspectives. Indeed, a good chance meeting. yes fine, but i disagree, and also don’t want to get caught in an argument, as i said i’m on some serious deadlines, i don’t want to be drawn into these discussions.they’re time consuming and ultimately pointless, you’re not going to make me change my mind…sorry! i think the comparisons i’ve made are eminently valid. Thanks for leaving a comment and linking my post Marc…every other institution in this country suffers from acute class bias, it would be astonishing if the judiciary was exempt, but of course we have plenty of evidence in the extremely low number of white collar criminals languishing behind bars and the high number of convictions and detentions of poor people, such as the Trenchtown labourers I mentioned. The Kern Spencer case is more than enough evidence for many of us that the judicial system is biased, if you wanted to overlook the one i mentioned earlier, the Beckles case.